"A pragmatic and creative approach"
Safety is at the core of all nuclear activities. Over the past seven decades—since the first experimental reactor was brought to criticality in 1942—codes, standards, procedures and regulations have been established, along with regulatory bodies and international guidelines to ensure plant safety and the protection of nuclear workers, neighbouring populations and the environment. 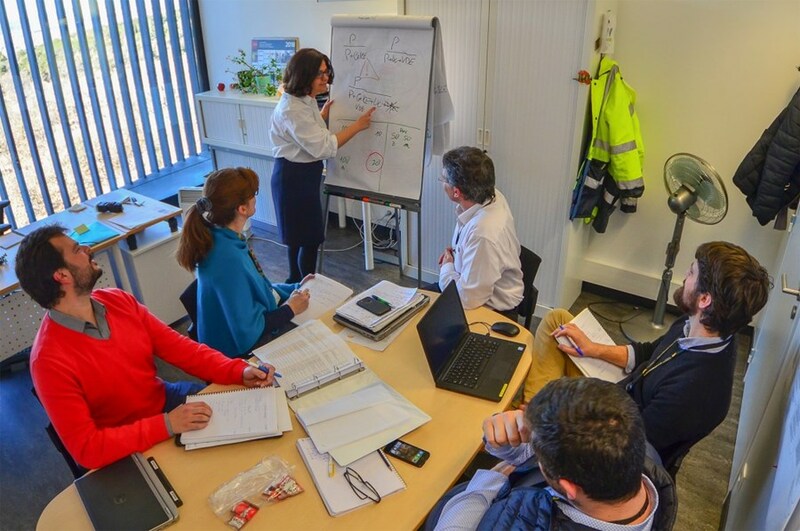 The safety approach at ITER is a ''creative and adaptive process,'' says Joëlle Elbez-Uzan (seen here at the whiteboard during a meeting with her team) who heads the ITER Environmental Protection & Nuclear Safety Division. Until ITER however, all nuclear activities and installations were founded on fission—the splitting of heavy elements such as uranium. With ITER, a new form of nuclear energy, based on the fusion of light elements, has entered the stage. ITER is the first fusion device fully categorized as a nuclear installation. Although the physics of fusion and associated risks are radically different from fission, some of the issues ITER has to manage are familiar to nuclear safety experts. Others—such as the extremely energetic neutrons produced by the fusion reaction or the quantities of tritium present in the installation—are unprecedented. "Generic" safety studies for ITER began in the mid-1990s, at a time when a site had yet to be chosen to host the installation. Adapted to the present location in France, and in the logic of continuous improvement and refinement, these studies continue to this day ... requiring further exploration, simulation and demonstration. In compliance with the 2006 ITER Agreement, ITER observes French safety regulations and, like any nuclear installation in France, submits to the stringent controls and inspections, both "notified" and "unscheduled," of the country's regulatory body—the Autorité de sûreté nucléaire (ASN). The ASN demanded the same approach as for any nuclear installation in France, where it is the responsibility of the nuclear operator (the installation "owner") to define safety objectives and functions, identify risks, and describe means to mitigate and minimize them. This approach is particular to France: safety regulations here are not "prescriptive," meaning that they don't mechanically correlate an identified risk with a pre-defined protection. Tritium—one of two hydrogen isotopes (with deuterium) involved in the fusion reaction—is one of them. Tritium is the most benign of all radioelements, emitting low-energy electrons ... so low in fact that a Geiger counter cannot detect them and skin, or a sheet of paper, are enough to stop them. It is when ingested, or inhaled, that tritium can become a health hazard. Tritium is hydrogen with two extra neutrons. It easily binds with oxygen to form tritiated water and, as its nucleus is very small, is difficult to confine. "It's a pragmatic, graduated approach," says Joëlle Elbez-Uzan, who was part of the early 2000 European ITER Site Studies (EISS) and who now heads the ITER Environmental Protection & Nuclear Safety Division. "The French regulations define the objectives, and let the nuclear operator propose the means to meet these objectives. Solutions have to be proportional to what is a stake in terms of safety. It's a creative and adaptive process ..."
"Oversizing" protection is an obvious option when seeking to mitigate risks. But oversizing has consequences not only in terms of cost but also in terms of robustness. "The more massive a protective measure gets, the more complex and the less robust it becomes. By applying a 'just required' approach we minimize costs and achieve better robustness," adds Joëlle. Such a philosophy is well adapted to a fusion installation whose potential risks cannot be compared to those of a fission installation. Joëlle remembers that when she moved from fission to fusion the first thing that struck her was the fundamental difference in physics. "What happens in the core of a fusion reactor is intrinsically safe—if parameters cease to be nominal, the reaction simply stops. And of course this is something we had to take advantage of." Whereas a fission reactor contains more than one hundred tonnes of solid fuel (enriched uranium of mixed uranium-plutonium oxide), there is never more than a few grams of gaseous fuel in the ITER vacuum vessel at any given time. As a direct consequence, the stored energy is minimal. This and other fusion-specific characteristics have led safety experts to rely as much as possible on "passive solutions" for ITER. The cooling water system is not classified as a "safety function" in a fusion reactor, for instance. It comprises a single loop only, whereas in a fission reactor a second loop must be able to take over from the first in an emergency situation. Although some of the safety parameters for the ITER design were established by extrapolating from the fission world, safety analysts were confronted with a number of never-before-encountered situations. Because of its operational needs, ITER will have to manage significant quantities of tritium—a situation Joëlle describes as "completely new for a nuclear installation." In dealing with tritium [see box], the "lessons learned" approach proved essential. Feedback from CANDU reactors, the Karlsruhe Tritium Laboratory and even the JET (European) and TFTR (US) tokamaks, which handled minute quantities of tritium during experiments in the 1990s, provided a basis to develop R&D tritium handling programs up to prototype scale. The vacuum vessel also raised specific safety issues, as there was no readily available code applicable to this unique component and the stresses/forces it will be subjected to. Codes applying to fission reactor vessels were adapted to the specific geometry of the ITER vessel and to the conditions it will face (for instance the impact and subsequent irradiation of the inner walls by energetic neutrons, or unique stresses and movements—such as vertical displacement events). "ITER operation and its progressive ramp-up will provide a unique opportunity to confirm our hypotheses, validate the safety methodology and refine the regulatory framework and international guidelines for fusion installations," says Joëlle. For decades, nuclear safety was not central to fusion research, as only two experiments—and only very briefly—had ever employed nuclear fuel in fusion operations. Now, with ITER, everything has changed. "Ensuring the safety of an installation goes way beyond establishing codes and procedures," says Joëlle. "It is about embedding a 'safety attitude' into each and every action we take. What is at stake here is nothing less than the project's success."